I had a few goals in purchasing this pack; find a pack that would fit a woman's frame well, hold 2L of water, and give me some extra space for whatever I decided to throw in it. It took a few days of comparison shopping online, reviewing forums, what other trail runners wear and like, and finding a pack that ships to Canada. Finally success, the Salomon Agile 7. Ample Space: For my first run with this pack I used it for what it was designed to do, hold 2L of water and a few other trail essentials. The space in this pack is not an issue. The bladder (sold separately) gets its own compartment for easy access and the space available for other essentials is more than enough for food, my galaxy phone and a light jacket. Fit: Wow. Just WOW. With my pack full I couldn't believe how light it felt on my shoulders. The arm and waist straps are adjustable giving the runner a cozy, supportive fit. I've run trails and navigated city streets with this pack, going over all sorts of terrain and never felt like this pack held me back or made me change how I would navigate a landing on rough terrain. It becomes part of you! Flexibility: The straps give a great fit but the Agile 7 also has a bunch of loops and cords available on the side that are perfect for trekking poles, a light jacket or clip-on supplemental water (as if it doesn't hold enough!). Safety: One surprise I didn't notice when I bought the Agile 7 is the attached safety whistle on the left shoulder strap. Nice Salomon! Now I haven't had to actually use the whistle yet but it has crossed my mind when I have to cross 6 lanes of traffic... But seriously, if I ever get hopelessly lost in the woods-see last year's Cuddly Coyote report....well, lets just say it might come in handy. Breath-ability: The honeycomb vents along the back of the pack make this pack one of the more sweat-free of hydration packs I've tried. Lack of Front-sitting bottle holders: yeah I know Salomon has this feature on other packs but it'd be nice to see it on a pack that holds less than 5L of water, and for less than $150.00. Just sayin'. Overall: This is my go-to pack. I use it for my trail runs of course but it is also an excellent run-commuter pack that successfully holds my gigantic wallet, office badges, phone cord, phone, pair of shoes, a complete work outfit and a light jacket (if I hook it to the exterior loops). 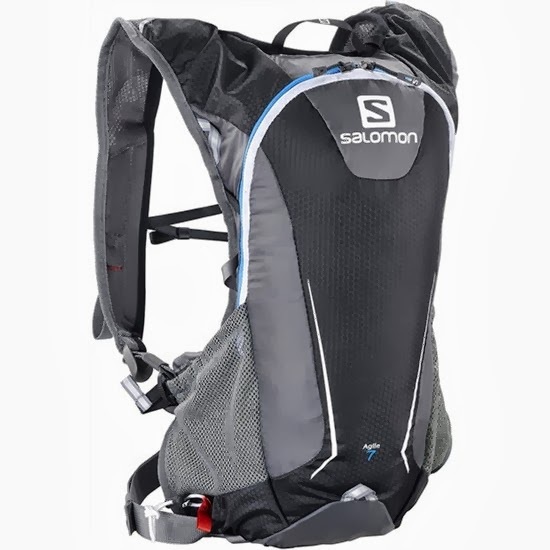 Salomon hit a home run with this pack and I'd highly recommend it to any runner, walker or cyclist looking for something that holds more than a liter of water.